Crystal Quartz Shri yantra Energy Generator from Natural Agate has rudraksha stones attached to the four crystal pencils. 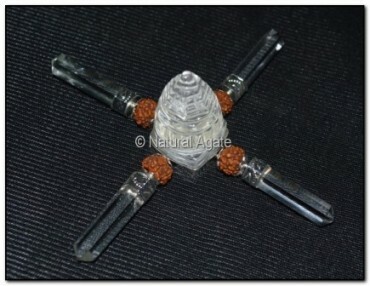 Both Shri yantra and rudraksha are sacred and powerful. The energy from this energy generator will shield you against any harm and danger and connect you to the spiritual energy. It will channelize positive energy.